Interview with Ashton Lansdell and Emily Tsujikawa of the Women's Baseball World Cup. In most ways, Ashton Lansdell and Emily Tsujikawa are your typical high schoolers. They like to hang out with friends. They spend Friday nights cheering from the stands at football games. They cruise around, an extra swagger in their step, with their newly minted drivers’ licenses tucked snugly into their wallets. They’re your run-of-the-mill teenagers, except for one thing: these two young women played on the USA Baseball Women’s National Team’s elite 20-woman roster at the Women’s Baseball World Cup in August. Make no mistake: even though they were the youngest on the team, these two rookies were well aware of what they were up against. Hosted on U.S. soil for the first time in its 14-year history, the Women’s Baseball World Cup wasn’t just about beating perennial powerhouses like Japan or Canada. They were playing for something even bigger: the chance to prove that women belong in baseball. “I was taking my chem final,” says Tsujikawa. “I had to celebrate in silence in the back of the class.” That’s how this 17-year old found out she had made the USA Baseball Women’s National Team in mid-June. Up until that point, this western Washington native had been putting in the work to be a starter at Redmond High School with her sights set on advancing to college ball and be one of three women in the past five years to do so. 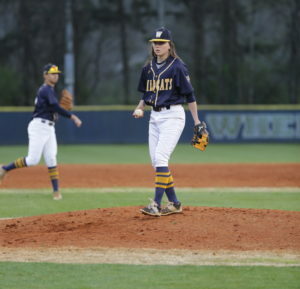 As a sophomore on the JV team, she made a name for herself as a “backwards pitcher,” relying her offspeed to win ball games. Last year, her ERA was 0.00 for 21 1/3 innings pitched, throwing a complete one-hitter in just 68 pitches. But she had never imagined that she would play on an international stage. In fact, she didn’t even know that option existed. She’s not the only one. Of the 1,145 girls who played high school baseball during the 2016–17 season, only about 30 came to the open tryouts in Cary, North Carolina in June. And of those, Tsujikawa and Lansdell, two of the top prospects in the country, had only recently heard about the Women’s National Team—the most distinguished baseball opportunity for women in this country. Despite being the highest level of play for women, the team still lacks a solid foundation for player development, forcing the most elite 20 players in the U.S. to prepare to compete on an international stage at the World Cup by scrimmaging against high school teams. Nonetheless, opportunities like these are few and far between for young women playing baseball. Only a handful have moved on to play college baseball, and even fewer have progressed to play in professional men’s leagues. Even those who play at the high school level struggle with acceptance. 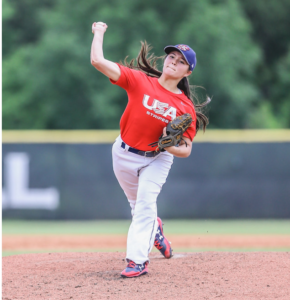 At 17-years old, Lansdell and Tsujikawa represent a growing pool of talent that’s rising out of the women’s baseball scene in the US—talent that enables the sport to flourish. They know that there’s a lot of work to be done. But they’re clear on what the future should look like. These two 17-year olds are pushing the proverbial envelope, breaking down boundaries for other girls to play high school baseball. And at the end of the day, they don’t care whether they have to keep playing with the guys—they just want to be seen as equals.